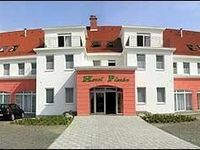 One of the new hotels in Debrecen, 5 minutes from the city center, along road #47 and in the immediate neighborhood of the Debrecen Airport. Various types of rooms, cozy atmosphere, air-conditioned restaurant and reasonable rates await our guests. Our hotel is an ideal location for team-building and conference events. Accommodation: There are standard and superior rooms in the hotel, and a few apartments. All rooms can host an extra bed. The standard double rooms are twins, with bathroom, TV set, telephone and minibar. Superior rooms are more modern, with bathroom, Tv set, writing desk, sofa, minibar and telephone. 70% of the rooms have internet access (ADSL). Comfort: There is an infra-sauna in the hotel, for up to 2 persons. In addition, there is a Finnish-sauna for up to 5 persons, a Jacuzzi for up to 4 persons, and the necessary relaxing area. Gastronomy: Cozy atmosphere, air-conditioned restaurant and reasonable prices await you. Our restaurant offers both Hungarian and international dishes. We can host family and company events alike. The hotel.s own confectionary makes very delicious cakes. Meeting room: The air-conditioned meeting room of the hotel is an ideal location for various events. Capacity: 40 persons. Technical equipment: telephone, fax machine, VCR, CD player, TV set, flipchart and internet access. The computer in the hall can be used to surf the web. Discounted entrance to the Aquaticum Mediterranean Aqua Park can be obtained in the hotel. Other services: wheelchair access, closed parking free of charge, central safe, dietary and vegetarian dishes, room service, non-smoking rooms, own garden, and pets are welcome.